The Lindsay Pettus Greenway is a reflection of what we can do when we all come together for a common goal. This greenway is all of ours. We are building it together. Over the past few years, we have joined with a wide range of residents and community partners to share how greenways have boosted the health & economic vitality of small towns across the region. Through it all, your generous support has led us to $4.7 million in financial commitments, which enabled the official groundbreaking event for Phase 1 to put be into motion! We are grateful to you for your steadfast commitment in co-creating a landmark destination for the City of Lancaster. Together, we are changing what's possible in our community. 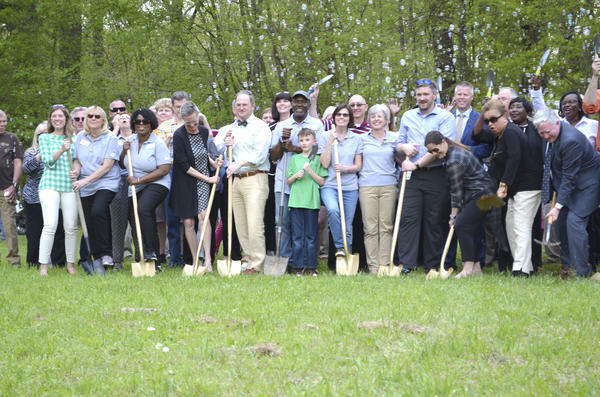 APRIL 11, 2019 - The Lindsay Pettus Greenway broke ground behind the Barr Street Learning Center on Thursday, with dozens of people wielding shovels and garden spades amid a flurry of celebratory bubbles. Butterflies were released during the ceremony in honor of conservationist and local historian Lindsay Pettus of Indian Land, for whom the greenway is named. Pettus has been a leader in protecting natural and cultural resources in the Catawba River Valley for nearly 40 years, founding the Katawba Valley Land Trust in 1992. MARCH 1, 2019 - The Lindsay Pettus Greenway is growing thanks to Lancaster leveraging $1 million that will connect the trail to downtown. Both the city and Lancaster County will receive $400,000 in Transportation Alternative Program (TAP) grant funding from the S.C. Department of Transportation. The program provides opportunities for local governments to pursue pedestrian facilities, bicycle facilities and pedestrian streetscaping projects. FEBRUARY 5, 2019 - As we await for the final permit from FEMA to be issued, we are diligently working on projects that do not require immediate government approvals. These projects include: (1) drafting drawings for our nature pavilion as part of the environmental education area and (2) partnering with professional naturalist Josh Arrants of Arrants Outdoors to create an inventory of the flora and fauna surrounding the Greenway's property. 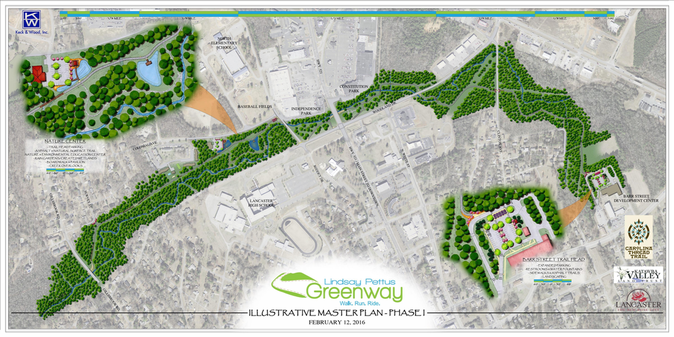 SEPTEMBER 8, 2018 - The Lindsay Pettus Greenway has received $150,000 from Comporium to incorporate STEM-related education features at the proposed environmental center planned as part of the trail’s construction efforts. The environmental education features of the Greenway will empower our youngest residents, families, and any future Greenway users to learn more about science and technology, while also learning how to be good stewards of the environment. We thank Comporium for its financial support and are eager to begin developing this initiative! JUNE 1, 2018 - The Lindsay Pettus Greenway received a $100,000 grant to further its commitment to protecting and enhancing the natural environment along the Gills Creek waterway. The grant is part of the Water Resources Fund, a $10 million commitment from Duke Energy that will leave a legacy of improved water quality, quantity and conservation in the Carolinas and neighboring regions. The Lindsay Pettus Greenway is a planned hard-surface trail for the City of Lancaster, South Carolina. It will connect people to places of interest, including schools, the hospital and medical facilities, the downtown district, and other businesses. It will run alongside Gills Creek and accommodate walkers, runners, and cyclists. Join in the public support for a greenway in Lancaster! We're a 100% volunteer-led non-profit organization. Every dollar goes towards the construction of the Greenway. Donations are tax-deductible as allowed. Donate online or mail checks to: Lindsay Pettus Greenway, PO Box 1776, Lancaster SC, 29721.